The backup proxy sends a request to the ESX(i) host to locate the necessary VM on the datastore. VM disks are attached (hot-added) to the backup proxy. 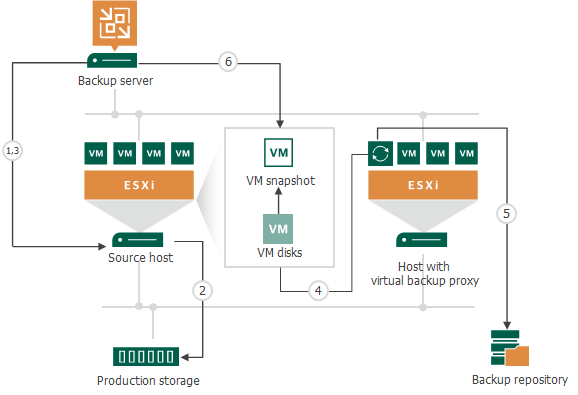 Veeam Backup & Replication reads data directly from disks attached to the backup proxy. When the VM processing is complete, VM disks are detached from the backup proxy and the VM snapshot is deleted. The process of data restore in the Virtual appliance mode works in a similar manner. VM disks from the backup are attached to the backup proxy and Veeam Backup & Replication transports VM data to the target datastore. After the restore process is finished, VM disks are detached from the backup proxy. ESXi host interacts with VMware Cloud on AWS through VMware vCenter. Veeam Backup & Replication performs backup through the networkless Virtual appliance (HotAdd) mode.